A source defines a set of configuration parameters for a specific Oracle Knowledge instance. When you want to index more than one Information Manager repository, configure one source per repository. A descriptive name of your choice for the connector source. The connector used by this source. In this case, select Oracle Knowledge. Note: If you do not see Oracle Knowledge in the Source Type list, ensure that your environment meets the requirements (see Oracle Knowledge Connector Requirements). Enter the base URL of your Oracle Knowledge server. Important: The starting address specified here must match the one entered in the security provider configuration page (see Configuring an Oracle Knowledge Security Provider). 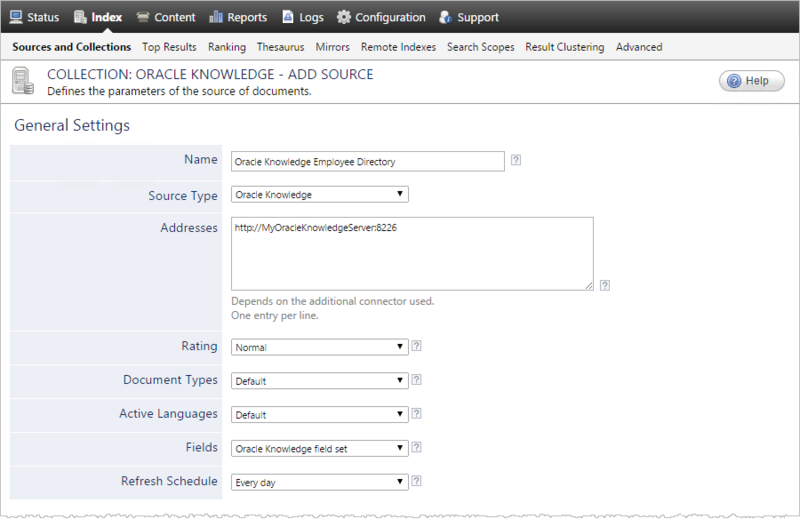 Select the field set that you created earlier (see Oracle Knowledge Connector Deployment Overview). Change this value only when you want to globally change the rating associated with all items in this source relative to the rating of other sources (see Understanding Search Results Ranking). Example: When the source indexes a legacy repository, you may want to set this parameter to Low, so that in the search interface, results from this source appear lower in the list compared to those from active repository sources. Time interval at which the index is automatically refreshed to keep the index content up-to-date. By default, the Every day option instructs CES to refresh the source everyday at 12 AM (see Creating or Modifying a Source Schedule). Note: The full refresh is a safety net to ensure all modifications are taken into account (see Oracle Knowledge Incremental Refresh Limitations). Important: The repository name specified must match the one entered in the security provider configuration page (see Configuring an Oracle Knowledge Security Provider). Enter the root URL of the Oracle Knowledge server resources. Whether to index the latest version of the content records, even if the version is unpublished. By default, only the latest published version is indexed. Whether to index discussion boards. By default, discussion boards are indexed. Keep this check box selected (recommended). 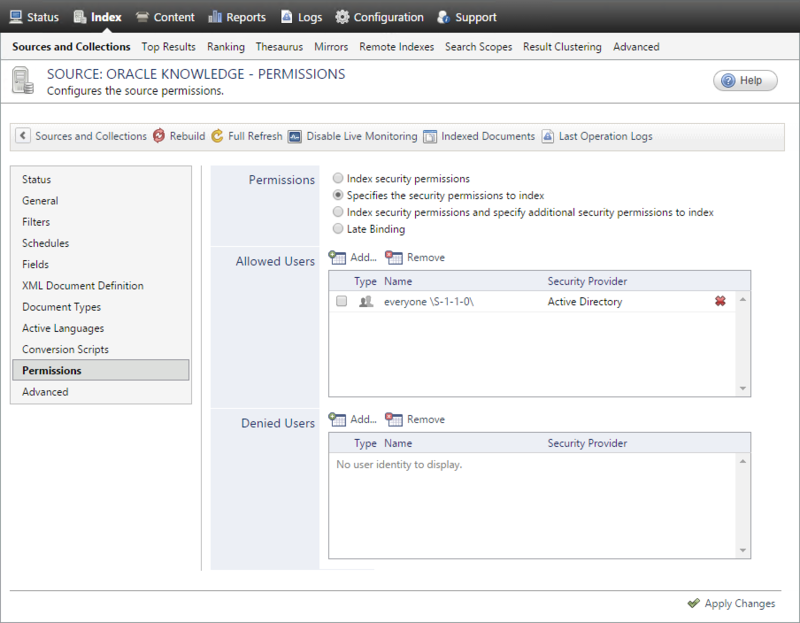 By doing so, all subfolders from the specified server address are indexed. In the Authentication drop-down list, select the Oracle Knowledge crawling user identity that you created for this source (see Oracle Knowledge Connector Deployment Overview). In the Security Provider drop-down list, if you chose to index permissions, select the Oracle Knowledge security provider that you created for this source (see Configuring an Oracle Knowledge Security Provider). Otherwise, select None. Consider modifying advanced source parameters (see Modifying Hidden Oracle Knowledge Source Parameters).